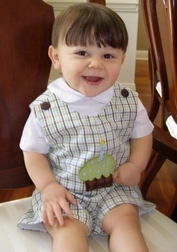 Caroline Bradlee Designs > BIRTHDAYS > BOYS > Boy's Birthday Cupcake Outfit. 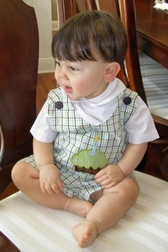 We just love this lovely fabric and its fabulous colors of green, brown, white and light blue. We just had to do an outfit with it and chose this precious birthday design. The outfit is available as a John John or longall and is made with the gingham as noted. The shoulders of the outfit fasten with 2 big brown buttons. 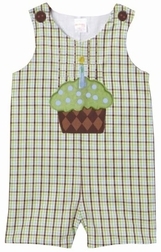 The front is appliqued with a big, sweet cupcake in coordinating colors. You choose the number of candles for the cupcake depending on the number birthday your little one is celebrating. A name can be monogrammed on the cupcake bottom. And, what birthday is complete without one of our matching birthday hats! The hat is made out of the same brown fabric as the cupcake bottom and is trimmed around the brim and at the top with light blue pom poms. You choose what saying or applique you would like on the front of the hat. 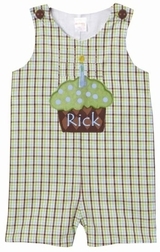 If you choose to applique the number, it is made with the gingham fabric. SEE OUR BIRTHDAY HATS IN OTHER BIRTHDAY OUTFIT LISTINGS FOR EXAMPLES OF THOSE THAT WE HAVE DESIGNED.